It has always been a favourite of mine, especially for UDP scanning and scanning large networks (and getting it done fast). In some ways the implementation is better than Nmap – in some ways worse. Both are great tools and for me, they work well hand in hand, both have certain advantages over the other in different situations. 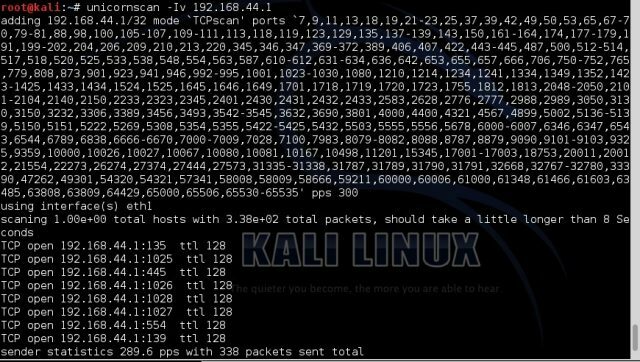 I did get halfway to writing an article about Nmap vs Unicornscan for large network scanning. Asynchronous protocol-specific UDP Scanning (sending enough of a signature to elicit a response). Anyway, the good news is it has finally been updated and v0.4.7 is available and released for download. I have to wonder if it is due to the fact that I went the lazy way and just did apt-get install for PostgreSQL. Until I get this figured out, I will not be able to provide my initial thoughts. meh. If you install the postgres-devel package, Unicornscan’s configure should be able to find libpq-fe.h. That should only be required if you’re using –with-pgsql in the configure. If you drop the –with-pgsql, you can compile unicornscan without database output support. That did it for me after an Etch minimal setup. I’m currently in the process of rebuilding my network at home, so unfortunately I don’t have a spare Linux box to test this on. I am still having library issues with getting this set up, even without the postgres flag being removed from configure. I did try with MySQL (since it does reference that you are not using it in the configure results), but got a similar devel error as with postgres. Due to other items of higher priority (ramping up for my new job), I have let it lie for now. Can’t you use RPM’s with Ubuntu? Yes, I can, but I wish to exhaust myself with trying to get it to work from source. That is how I have always been. Given, it has helped me learn a lot, but I am certain that I have lost a lot of hair and time over it. Wow! Looks like a great program. I have been using nmap for quite some time and now it seems like theres something out there that is even better. Thanks darknet!